Refugees, Illegal immigrants, People fleeing their country for a better life. Such stories are always in the news and like most things in life there are at least 2 sides to every story – if not as many stories as there are illegal immigrants. Each person has a unique story to tell. But do we want to listen? Do we want to hear what they have to say? 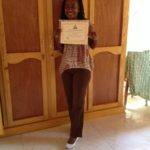 Do we care about others’ dilemmas? Or are we so caught up in our own little worlds and lives that the plight of others goes over our heads. 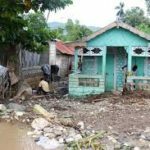 Here in Haiti, an island country, mostly surrounded by water, efforts to leave everything they know and set sail for a better life are ongoing. 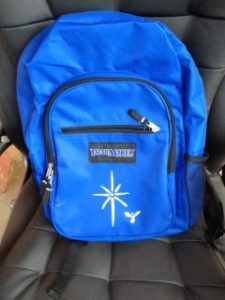 As summer continues and school is out here in Northwest Haiti all those involved in the six schools where the Religious of Jesus and Mary (locally known as Sé Rose e Sé Na) are involved are looking forward to the coming school year, when each of the 600 children attending these schools will receive a brand new school bag. Long Awaited Computer Training at last! 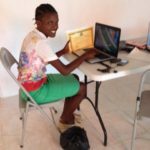 New Technology in Colette, Jean Rabel, Northwest Haiti. 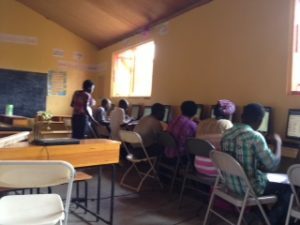 From 27th June to 1st July, the teachers and friends of Deux Jesus School in Colette got to grips with basic computing skills using the brand new computers recently installed by Camara. 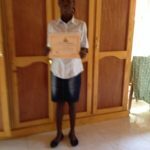 Six students proudly received certificates of completion having attended all lessons and gaining practical skills in text processing and spreadsheets which will help with future administration tasks and class planning in the school. 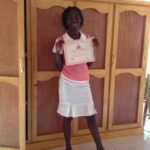 Rose Kerline Innocent, a student of a previous class ably assisted with explanations and Kreyol translation. 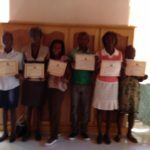 Below are the 7 people who completed a full week’s training in IT in Colette, Jean Rabel, NW Haiti. Director of Deux Jesus School Mentil Joseph Michel, Derise Louis, Dorilus Veniel, William Benito, Vernot Jhonwalker and Supreme Rose Andre. Vernot Jhonwalker was so happy with his achievement he wanted an individual photo. Food for the Poor Arrived! Eventually the engine stopped and it was going to be opened where it was. There were quite a few men standing around and I thought, ‘News travels fast.’ They were certainly on the ball, ready to get the food on arrival. Thought you might be interested in how things work here. This is a chemist shop in Jean Rabel. There is no electric light inside. Any electricity they have is generated from this solar panel outside the door! 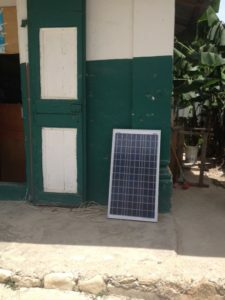 Any phone shops or others that want electricity have a similar arrangement along the side of the street, generating their own electricity supply from the sun. 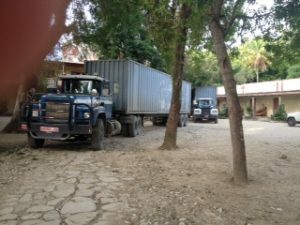 This is how most large items are moved from place to place in Haiti. 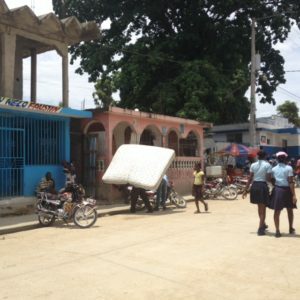 This man has most likely purchased a mattress and is just about to go into his home with it now, having carried it from the marketplace to his home, along the main street of Jean Rabel on his head. That’s what you call ‘free delivery’. That’s how I had heard the local hospital here in Jean Rabel being described and having lived here now for a whole month I wasn’t expecting anything plush when it came to visit the hospital. However, I was not prepared for what I experienced. 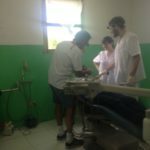 We walked through the waiting area of what seemed to be the outpatients department to get to where inpatients were staying, as we were visiting a specific patient who had been admitted 2 days ago with malnutrition. 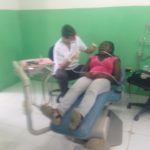 Our patient was a 4 year old boy from another area about a half-hour’s drive away who had attended our outreach mobile clinic. He didn’t look too bad, having been in hospital a couple of days now. He was out of bed and happy to chat with us. His mother was staying at the hospital with him and she had her youngest child with her, a 5 month old baby who she was breast-feeding. I’m in Haiti now 2 weeks and spent the last five days in Gros Morne, about 3 hours drive away. I had an eventful week, getting lifts to school and back on the back of a quad, along with two others. Matt, one of the volunteers currently living in Gros Morne with the Sisters of Jesus and Mary, Jackie and Pat, drove the quad while one of the teachers from the school and Geri another US volunteer and I got a lift on the back. It was my first time to ride on a quad and as the road surfaces are so bumpy I was hanging on for dear life! But the second day, I wasn’t quite so scared but held on tight just the same. Matt said I’d probably find riding a motorbike taxi was actually easier but I’m not totally convinced. 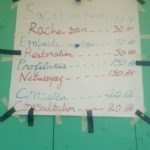 The airport in Port au Prince was striking: its bare walls, lack of colourful advertisements, notices or placards enticing visitors to buy their wares, struck me forcibly being in stark contrast to most airports I have visited. Very few people were allowed into the arrivals hall to meet their loved ones and family and friends wait outside under a covered area. A young man came muttering towards me gesturing that he would collect my bag, get me a taxi etc, but I was being met and didn’t need his services but found it difficult to ditch him. I didn’t want to seem ungrateful but really wanted him to leave me alone! Thank God Sr. Rose arrived to greet me and was able to convince my ‘helper’ that we were OK and she knew what she was doing. 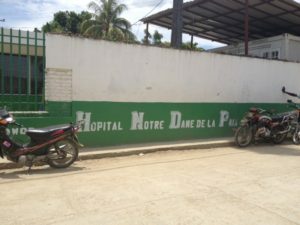 Well, I’m here a week now in Jean Rabel, North West Haiti and it’s a busy place with lots happening. After a bit of a shock to the system on the first evening when visiting the ‘facilities’ on arrival, I have become quite settled and used to the cold shower (which has warm water if you wait till the afternoon to shower) and it’s so hot the cold shower is welcome! The toilets I thought would take a bit of getting used to, normal to look at but no flush on it, we just fill a bucket of water to flush down the toilet after use. At this stage I’m well used to it and it’s not a problem! Every day brings a new experience! Today we attended a funeral of a lady who lived quite close to where I’m staying and Sr. Rose and Sr. Nazareth (Naza) knew her. Despite not being well off everyone who attended was dressed in their best clothes, much more respectable than generally seen at home! Looking at the congregation you certainly wouldn’t think the people were short of money, and there seemed to be a big coffin, which seemed to me to be spray-painted a lightish blue colour. 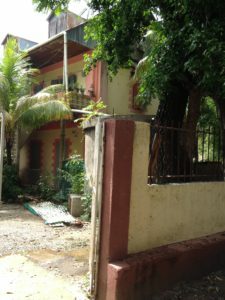 The family of the lady who died were wealthy enough and one of the sons lives in Miami but had the body brought back to the home place for burial. 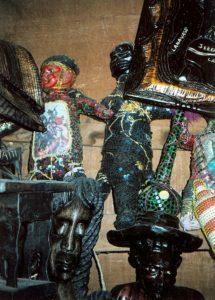 Just as well Rose and Naza had explained to me the ways of funerals in Haiti. The ‘wake’ goes on all night the night before, with lots of keening and howling and music, and we could here it right up to maybe 2 or 3 am as we’re close by. It was raining through the night and only for that the ‘wake’ may have gone on till morning. At the funeral itself in the church the keening started again as soon as the priest finished the sermon, and spread among the womenfolk. Some of their singing drowned out the sound of the howling but not fully. 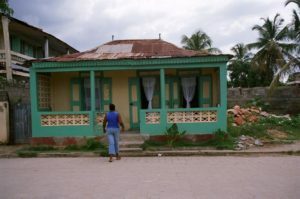 Afterwards a band leads the funeral procession to the cemetery which isn’t far away and the congregation walks behind, much keening and howling again, although the music is happy music and that’s important to the Haitians as they want to see their beloved ‘sent off’ happy! Sunday, 15th we went to the beach, the exact location where Christopher Columbus landed when he discovered the Americas. It’s a little place called Môle-Saint-Nicolas and if it was anywhere else in the world I reckon it would be thronged with visitors, day-trippers and tourists on a Sunday, but not in Haiti. 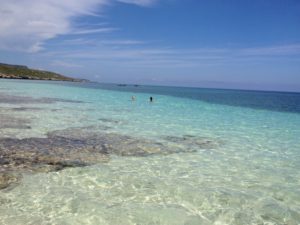 It is a little cove where you can access a wonderful white sandy beach that leads to a most spectacular, turquoise, warm to the touch, tranquil sea. I’ve never set out for a day at the beach at 8.00 a.m. before but due to heat later on that was the best time to go. 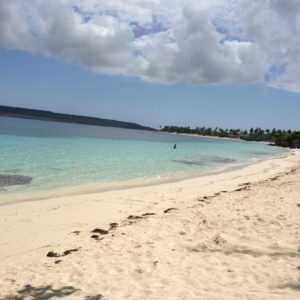 It took us about an hour and a half to reach the beach, but it was well worth the journey – it’s a little paradise in the north west of Haiti and could be a gold-mine for entrepreneurs willing to set up shop in this location if access was better. 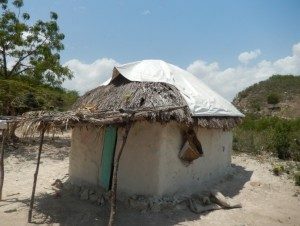 As always in Haiti once you leave the immediate vicinity of a town, you have to navigate the rocky roads, rivers, mountains and pulverised surfaces to get to your destination. 18th May was a national holiday here in Haiti; it is what they call Flag Day. And here in Jean Rabel the celebrations began the day before, with all the school children parading through the town to the sound of brass bands, drums and singing behind their flag of red, white and blue. 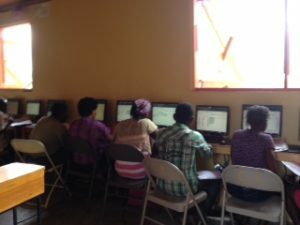 19th May: I began teaching the ladies in Sr. Naza’s workshop some basic computer skills today. I began with teaching them the basics of touch typing, as it was the easiest thing to do with not all the computers available being uploaded with the educational software we had received from Camara, an international charity that supplies old reconfigured computers to people throughout the world who otherwise wouldn’t have access to such technology. The 6 ladies who came along showed great enthusiasm and a real interest in learning how to use the computers. Some I would say have had a little bit of experience but others haven’t. And in my very limited Creole, I got the impression from them that none of them was used to the Internet. I believe once they get a grip on how to use these machines and see the potential for their own development through using them and with access to the Internet, their lives and those of their children will make steady progress. I certainly hope so! They live in such a remote place here in Jean Rabel. 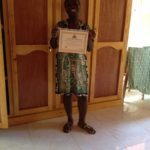 Hopefully access to the Internet will be able to offer them a means they currently don’t have to make a living or augment their current income, which is very minimal. These women deserve a chance to have access to opportunities currently afforded to us in the western world. One of the main things that restrict them at the moment is the lack of and cost of transportation infrastructure. 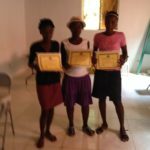 Currently, these ladies have no way to get their produce further afield than their local area – and they make beautiful hand-made goods and crafts in the workshop – the road system is really non-existent, taking at least a few hours to get to any of the nearest towns and 6 to 10 hours to the capital of Port-au-Prince, so exporting their wares is completely out of their reach. 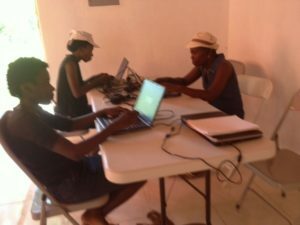 But if they can progress in the area of computer office applications, perhaps there will be a way into the future where they can work from home or a designated area in Jean Rabel, for clients outside of the country. This would mean they could enjoy the good aspects of their local lifestyle and earn a decent income for themselves and their families. 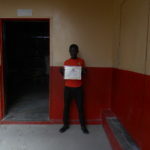 This is the hope of the project here in Jean Rabel, that opportunities will increase and a better way of life will emerge for the youth of the area, where up to 50% of the population is under 16 years of age.